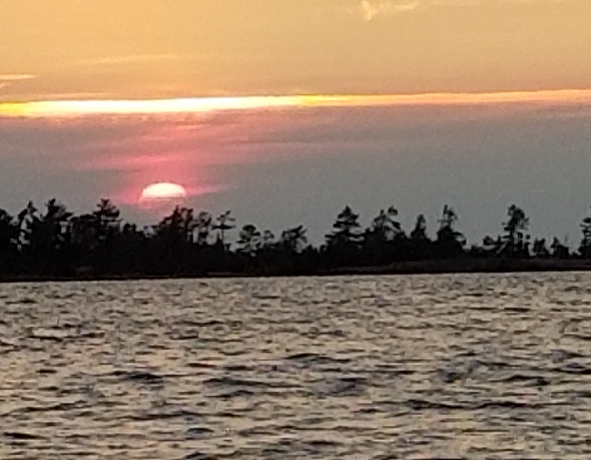 I am back in the literary engine room after a two-week boating excursion into northern Georgian Bay complete with forest fires, travel restrictions and mechanical malfunctions–all part and parcel of navigating the ever-steepening learning curve of boating. As an individual trained in finance, nothing is more terrifying than turning on your marine generator only to see blue smoke pour out of the exhaust pipe. Being without battery power four hours from the closest marina is analogous to being up “Effluent Creek” without the proverbial paddle. However, the reason I used word “serendipity” as the title of today’s missive is because of a series of events that occurred last week while we were moored in the Massassauga Park, a boater’s paradise located near the Moon River as it empties into the bay. Friends of ours awoke one morning to find that the generator/inverter on their big Chris Craft was acting up and after a series of attempts to rectify the problem, it was apparent that this was a non-fixable issue and they were forced to head into the closest marina to access shore power so the batteries would not die (which is a big no-no with $8,000 as a replacement cost). Now, if you have ever been into the engine room of a big boat, you know that they are designed for tiny people with little hands and my buddy stands about 6’4″ and weighs somewhere north of 250 lbs. with hands the size of an offshore driller (which he was), so trying to trace the myriad of pipes and wires in a matchbox-sized engine room is nigh on impossible. So he arrived at the marina and it just so happens that the boat next to him is an American boat with a captain (Steve) that is a licensed boat captain and a master mechanic in his former life in Brooklyn, New York. Within minutes, this whirlwind of a man is down in the engine room and has located a faulty switch that is cutting power to the inverter so they disassemble it and jerry-rig it so it works and voila! Inverter problem solved. But wait. The next morning back at our anchorage in the park he tries to turn on the generator and it just coughs and sneezes and burps, and after he cleans out the filter and a few other checklist items, it is determined that the fuel pump is toast–and we were located in a remote bay about a hundred miles from any supplies. The definition of the term “serendipity” is “the occurrence and development of events by chance in a happy or beneficial way” and what happens next is beyond the realm of simple “good luck” because you needed a domino-effect of simultaneous events (all positive) in order for this much-anticipated two-week foray into the wilds of Georgian Bay to NOT be terminated with a three-hour return to the home marina. My big buddy calls the chap that runs the mechanical service area of the marina and says he is texting him a picture of the faulty fuel pump and asks him if he has anything that could be substituted. It turns out that they have three used fuel pumps that just might fit a 25-year-old generator but how in the world are they going to get them to us? Well, this is where the true wonderment of “serendipity” arrives in full splendor as it turns out that the marina owner flies a float plane and actually has a cottage about fifteen minutes away by dinghy AND that he is flying up in a half hour. They load the spare parts into the plane and they arrive at the cottage where they are loaded into the dinghy and are back on the crippled boat by noon. After a couple of tension-filled hours, the replacement pump is installed and the starter button pressed and after a few seconds of breathtaking suspense, the welcomed sound of a purring generator echoes the treed walls of Ritchie Bay and the circle is suddenly and miraculously complete. What appeared as a vacation-ending disaster is magically transformed into the full embodiment of the title of today’s missive. What are the odds of a series of events such as I have just recounted ever actually repeating themselves? The occurrence and development of events that started with the happenchance of meeting a master mechanic at the exact point they arrive at the marina could only be matched by the happy and beneficial arrival of spare fuel pumps. The relevance of this little anecdote to the current malaise affecting precious metals investors lies in the total absence of anything vaguely resembling “serendipity” in the behavior and performances of gold and silver for the better part of the year. I noted back in June that there appeared to be a plethora of reasons to be bullish of the precious metals, not the least of which was that July marks the beginning of the five best months for them from the perspective of seasonality. However, here we are once again in mid-August and spot gold has a taken a plunge to below the psychologically significant $1,200 level with silver threatening to violate $15, such that the seasonality trade, so elusive to capture in recent years, has once again proven to be a terrible timing tool. The much-heralded relative strength index (“RSI”), which has served me so well over the years, failed to act as a harbinger of impending reversal with plunges below 30 serving to stem the rate of descent but not the direction of price, which it has done pretty well over the years. If you want a well-trodden excuse for the poor tape action, look no further than the USD index, which has screamed higher since the Trump tirade against China went viral. Tariffs and economic sabre-rattling have forced markets to handicap a winner in the trade war arena and as I have opined in past missives, China’s currency will be massaged lower versus the USD to compensate for any gross shortfall in total revenue in order to offset the impact of tariff’s, while U.S. exporters get punished due to exchange rate disadvantages of shipping products more costly to European and Asian consumers. The most recent headline event is the crash in the Turkish lira, which is now threatening several major investment funds and more than a few banks over-exposed to Turkish bonds and other related assets. It resembles 1997 and the events in Thailand and a crashing baht. This event set off a series of events which resembled the complete opposite of “serendipity,” which took in the color and texture of a “Black Swan” event and was triggered by higher U.S. interest rates, contagion and debt default. This financial crisis resulted in severe recession and inflation and while the geopolitical backdrop was supposed to cause a recovery in the gold (and silver) price, it performed beautifully for those gold holders in Thailand, the Philippines, Malaysia, South Korea and Indonesia; it had the opposite effect in U.S. dollar terms. Fast forward to 2018. Holders of gold in Turkey are currently enjoying the true safe haven utility of gold by insulating them from crushing devaluation of their currency’s purchasing power, just as it happened in Venezuela a few years before and Argentina before that. It is the very reason that China and Russia are moving to establish an alternative to the current reserve currency status of the U.S. dollar because it is the actions of the Fed which can resemble a financial weapon and is used against countries and/or regimes such as the late Hugo Chavez of Venezuela and Recep Erdogan of Turkey. We in the West who have sought to protect ourselves from profligate fiscal and monetary policies of the U.S. and Canada have never really seen the impact of sound money investing because of the stranglehold the banks have on flows. They can choke off reserve currency availability for Thailand or Turkey, setting off currency-related death spirals in one keystroke, bludgeoning the USD higher through coordinated devaluations in the targeted countries (regimes). In this manner, the USD IS the safe-haven bid and all other currencies and other forms of money (which includes the ultimate form of money in gold and silver) depreciate against the USD. Gold and silver mining shares decline, precious metals funds get hit with redemptions, and believers in sound money principles suffer egregiously as sentiment melts away and investor psychology sinks into depression and capitulation. What investors desperately need is the confluence of a series of precious-metals-friendly events that result in higher prices that cause a simultaneous shift in momentum followed by sentiment. We need gold shares outperforming gold bullion and we need silver outperforming gold. The Gold-to-Silver-Ratio, which we shorted at 82.75 last April, remains a smidge under 80, which is actually a positive for the metals complex because if silver were collapsing at a greater percentage rate than gold, it would imply that a brand new down-leg was in the cards and we need that to move lower as well. Just as serendipity in life can arrive over a multitude of positive events all linked side by side in rapid succession, that same good fortune can also occur in markets especially when all of the planets align in tandem. The planetary alignment of late 2015 is exactly where we are today but without that final reversal that flushes out the bears and energizes the bulls. Just as good fortune last week wafted into the life of a stricken boater, I would submit that a similar event in the lives of stricken precious metals investors is imminent. 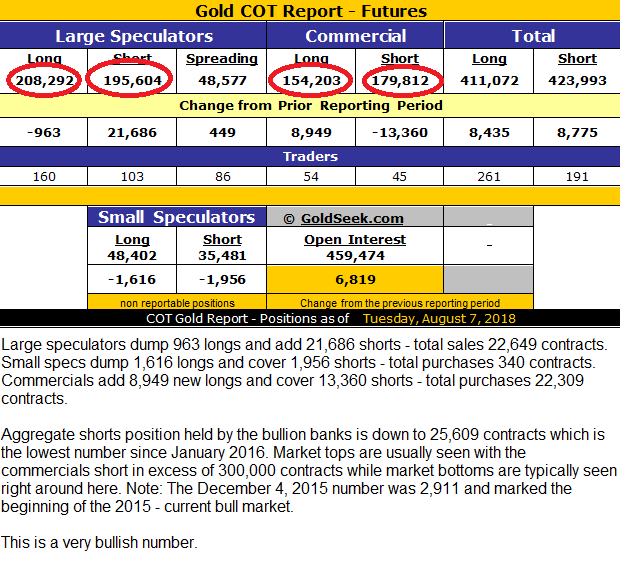 The preconditions for a continuation of the bull markets in gold and silver that began in late 2015 are solidly in place; the fodder is in the cannon; the powder is set. All that remains is the flint that sparks ignition and it is VERY close. The iShares Silver Trust ETF (SLV) rose $0.03 (+0.22%) in premarket trading Friday. Year-to-date, SLV has declined -13.88%, versus a 6.87% rise in the benchmark S&P 500 index during the same period.